24-year-old Dutch superstar DJ/producer Hardwell recently announced the launch of a special Q&A series on YouTube in which fans will have the opportunity to directly ask Hardwell questions. Every episode will have a specific subject that focuses on Hardwell and fans can ask anything that relates to that subject. Fans can submit questions via Twitter by tweeting their questions @Hardwell and adding the hashtag #HardwellQ&A, or simply asking a question on his Facebook wall by writing "Hardwell Q&A:" and then the question. 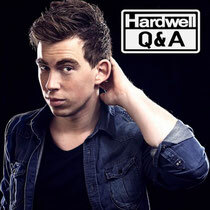 Hardwell will host multiple episodes on YouTube where he will answer the questions. When fans' questions are chosen, their name will be included in his video. Hardwell's next episode is all about his studio, so fans can ask him anything they want to know about his productions, equipment, techniques, etc. Hardwell: "With the opportunities of social media today, it's super easy to be in direct contact with your fans, however it's impossible to respond to each and everyone through Twitter or Facebook. That's how I came up with this idea, to give my fans the opportunity to ask me their questions and to have the chance to answer them in a fun way! We recorded the first episode already and had so much fun, it gives a good view on my life with some fun elements included, so it will be entertaining as well a must-see series I say!"